***this is a sticky post, please scroll down for newer entries. ty! It’s funny how real life turns out so different from its movie and tv representations. I grew up with the impression that men are the strong ones and women are homemakers, Martha Stewart clones if you may. Having my own family woke me up to the realization that my whole life was a lie and everything was turned upside down. Dramatics aside, I guess you can say that my partner and I are quite the unconventional couple. I do the handy work while he does the cooking. It’s not that I’m more of a man than he is, we just enjoy the division of labor this way more. When it comes to health, I am also the resilient one. My daughter took after my husband who isn’t really what I would call sickly but rather more sensitive when it comes to germs and bacteria that is why I am very particular about what goes in and out of our house. I grew up with a younger brother who had a very sensitive stomach and would be in and out of the hospital constantly from severe diarrhea. I saw my mother’s stress and worry each time they had to confine him. It’s something I never want to go through myself because a. who wants that? and b. I will not be able to stand the added workload to my already long list of chores. To avoid the unnecessary stress, I make sure that our water at home is clean and safe. From experience and advice from our pedia and G.P., only one name stood out among the bunch and that’s Wilkins. My partner’s grandma who is quite in her senior years and cannot afford to get sick or catch an infection swears by it. True enough, she has stayed reasonably healthy throughout the years. My mom has also shifted to Wilkins, so have we. And guess what? No signs of diarrhea or anything severe in our homes. So even if it is sometimes a hassle to drive and pick up our water supply, I don’t mind. Having healthy and happy “soldiers” at home make it all worthwhile. Do you have your own story to tell about Wilkins and your family? If you’re 18 and above, you can join the Wilkins Moms Know Best for a chance to get published and win cool cash prizes and GC’s from Wilkins. 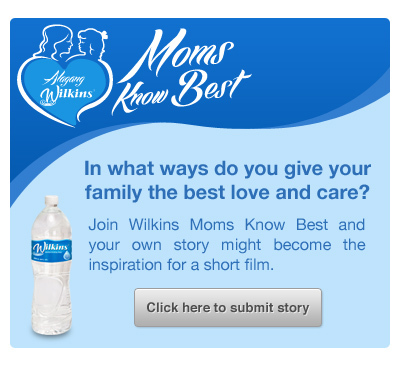 All you have to do is write your story in 400 words or less about how you give the best love and care to your family, the challenges you faced and the sacrifices/choices you had to make and submit to http://bit.ly/Wilkins-MNB1. 5 Stories will be selected for publication in Smart Parenting and will receive P5000 cash + P5000 worth of gift certificates for Wilkins products while the best entry will be turned into a short film and aired on TV plus a P10,000 cash prize and P5,000 gift certificates for Wilkins products. *Some talking points suggested by sponsors but story and opinions written are mine. more old pics pls! ;) Hehehe :D Cute cute! Awww... Your daughter is sooo cute!